For no important reason, I present the Mr. Coffee Wikipedia page. Armed Polite Society > Main Forums > The Roundtable > For no important reason, I present the Mr. Coffee Wikipedia page. Re: For no important reason, I present the Mr. Coffee Wikipedia page. Black Rifle Coffee is pretty good stuff. I've only tried the freedom fuel but it was good when percolated. That's probably my favorite of theirs right now. I like Combat Fuel better, but they either stopped making it or it's seasonal. I also recently tried Arbuckle Ariosa (the cowboy coffee kick) and it is quite good. Plus it comes with a peppermint stick in the package. I've actually gotten the cowboy coffee down to a "Ben system" where most of the time it doesn't come out at all bitter. It's just kind of a long "hands on" process compared to a press or percolator. Though my visitors from krautland (where everyone is big on coffee) this weekend thought the cowboy coffee was some of the best coffee they'd ever had. I had to make a couple of big pots a day for them, and I use one of those ginormous camp coffee boilers. Hey, I tried the salt with the cowboy coffee this morning. My cowboy coffee has been inconsistent. Not in a bad way, but from day to day it comes out pretty darn good to great. Today with the salt (about three pinches to the pot) it came out great. That may have been coincidental, but the other benefit seems to be that the salt helps settle the grounds out. I usually use the cold water trick, which settles out the majority of grounds, but I use a very coarse ground and there are always still a few "floaters" - the larger chunks of grind. This morning there were none. Whenever I make coffee like that (which is fairly rare), I use my tea strainer to catch the grounds. I'm actually far likelier to make tea that way than coffee, but most of the time I use my tea strainer for straining the pits out of lemon or lime juice. 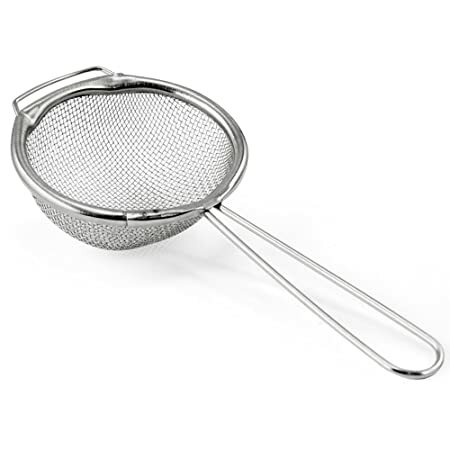 I use the identical strainer. I used to not, but over the winter I like to have coffee later in the day as well as the morning. I recently bought a stainless thermal carafe that keeps the coffee piping hot well into the afternoon, and after I make the coffee in the morning, I now pour it through the strainer directly into that. So what do you do, put the salt in the grounds or in the cup? I think you can do either, but I normally just toss it in with the grounds. I also, mainly in the winter, tap in some cinnamon. I like the back flavor that it gives my coffee. Yep I'll often toss in a couple pinches of salt when brewing a pot. I recently broke my glass container for my Bodum french press, but was gifted a Stanley one as a replacement. It's Stanley puke green like the thermoses and it is mildly insulated to keep coffee warm. That thing and an alcohol stove stay in my car. I have stopped on the side of the road to make coffee. Salt in the coffee was standard in the Navy. But of course I was making it in 200 serving perc pots with reusable cloth filters. Mmmm.